It almost always happens that when someone feels unbridled passion for a craft, it is usually the result of a long family tradition. For Emmanuel Servais Agboton, the story is quite different. He came to Cuba from Africa in 1980 as a young man and discovered here what would become the greatest passion in his life: antique mosaic tiles from colonial times that are found in homes, arcades, public buildings, sidewalks, just to mention a few of the places that are graced by these tiles. Emmanuel speaks with great love of the country where he decided to make his home and start a family over 30 years ago. 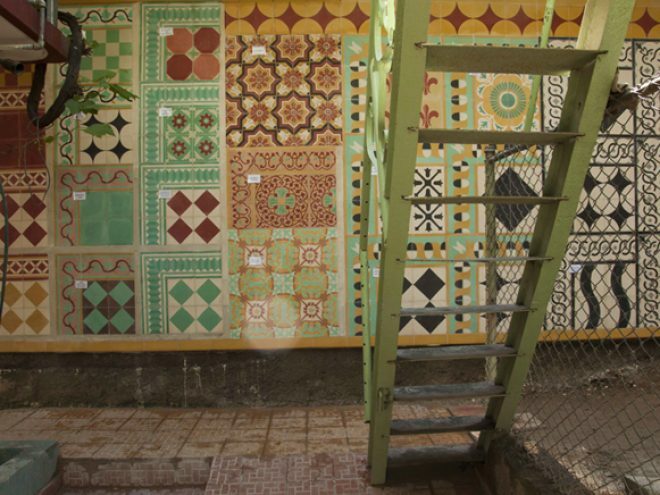 “Cubans walk on art.” he says, “There’s pure art under their feet.” Inexistent in his own country, Benin, mosaic tiles were something he came to know when he first came to Cuba. Since then, he has worked uninterruptedly in recovering this tradition—the manufacture of mosaic tiles (also called hydraulic tiles) following an age-old traditional methodology. The Artes Próceres mosaics factory specializes in reproducing and restoring colonial tiles from antique molds and provides technical advice for their correct laying. Much of this production goes to private homes. Although Emmanuel has a bachelor’s degree in electrical engineering, his true calling is the craft that he has shared for 17 years with his most experienced worker, 74-year-old José Agustín Hernández, who started making mosaic tiles in the 1950s at the prestigious La Campana factory. Today most of these factories are closed and only a few are still operating. Over 90 percent of the floors in Havana are laid with mosaic tiles, some even dating back to colonial times. However, the inexorable passage of time has taken its toll on the beautiful floors that are quickly deteriorating. Most of the time, broken or damaged household floors are replaced by the only option found in retail stores: identical, mass-produced tiles, usually of doubtful quality. This is why Emmanuel’s goal is to try and recover Havana’s floors as much as possible, remaining faithful to the centuries-old manufacturing technique. When Emmanuel began in this endeavor, he sought out master tile builders who were eager to pass on the secrets of their ancient trade. Although many of the designs are created exclusively by him, he has recovered damaged tiles, which many times had been discarded as worthless and useless. Producing mosaic tiles is not an easy task as it is an entirely manual job. No matter the size of the demand for these tiles, each piece is made one at a time from molds that contain cement and mineral pigments. Originally, tiles were prepared from a pigmented clay base and then fired in an oven. Following the discovery of Portland cement and the development of hydraulic presses, cement tiles are prepared without the use of clay or heating. The Artes Próceres factory has also introduced innovative alternative materials, recycling concrete debris, which is finely grinded and used in the three-layer tile. The desired color pattern stencil is then placed within the mold. These stencils are made of brass, which makes them easier to shape and form the lines and curves that will result in many beautiful designs, ranging from traditional flower designs to more modern contemporary ones. The mold is then filled with several layers of material, which will give resistance to the tile (it has been shown that the tile wears away at a rate of 1mm every 25 years). Appropriate colors are hand poured into each cell of the stencil. Subsequently, pressure is applied, depending on the use the tile will be given and the conditions it will be exposed to. Finally, it is rinsed with plenty of water and let to stand in a water bath for several days to cure to its final hardness, and later air dried. The end result is a durable and beautiful tile, which continues to be the ideal flooring for Cuba’s tropical climate. Emmanuel’s work is largely the work of an artist whose designs are inspired by his life, his emotions and his own ancestral culture. Accordingly, each tile made at Artes Próceres has a name, which is as beautiful and suggestive as the tile itself. Some of the names are descriptive of the tile’s design, such as Vineyard, Dove, Accordion, Fleur-de-lis, Seagull, Spyglass, Square and Checkers, while others have been named after his own family: Honorine, Philippe and Narcisse. Some tiles are reminiscent of his childhood, like Miriam Makeba and The Queen of Sheba. And still others wish good fortune to Cuban families: Prosperity and Progress.